Usually in the Save and Splurge edition, I show you one high end department store product and I tell you of a pharmacy/drugstore brand that might perform similarly. The EL ANR serum (as its affectionately known) is an oldie and a goodie for me. It keeps my skin hydrated and I swear it does do some repair work. But there isn’t anything drastic to see in the skin. I like to call it the “maintenance serum”. One you use when you just want to start getting into anti-aging skincare but where you have no real concerns about sagging skin, deep lines, bad pigmentation etc. At RM290/50ml its a bit of a splurge. You can read my full review on the EL ANR serum here. Yes I can do the math and yes, ml for ml this is more expensive, fiscally speaking. However, if you look at it from a dollar per use point of view, this is where the save element comes in. You only use a maximum of 2 drops of this elixir each time. For the EL ANR serum you use 1 pump. That is a marked difference. I’ve owned the Kiehl’s serum far longer than I have the Advanced Night Repair serum and I’ve barely made a dent in the Kiehl’s one. I’m already halfway through ANR. So dollar for dollar, you do get better value with this Kiehl’s serum. And coming back to how it performs, I personally find that it performs about as well as the Estee Lauder Advanced Night Repair serum. It keeps my skin hydrated and gives my skin a glow and is an all round good enough “maintenance serum” if you don’t have serious skin problems.You can read my full review here for a more well formed view. Which serum should I get? Here’s another suggestion. Try both. Get some samples and see which you prefer. Kiehl’s Midnight Recovery smells much better than Estee Lauder ANR if you like the smell of lavender. Performance-wise I’d say they are both decent enough. Rub palms to mix and apply on skin. I swear I wake up the next morning with super glowy skin, like I’d gotten a vitamin injection or something… without the pain or side effects 🙂 I’ve done this a few times already but not on a regular basis. Just for a bit of oomph! and I do like the effects. So yeah, that’s my save and splurge choices for night serums or anti-aging serums. Please feel free to share what you think or if you know of a drugstore serum that works as well. Save and Splurge is where I show you similar items by different brands that I have tried. They may not work quite the same way, but it’ll offer you options for your wallet for a similar effect/product. Do note however, that it is based on products I have tried, so whilst there are many save and splurge options out there, these are my views. You can find more under the category of Challenges. PREVIOUS POST: Your Say: Do I need to use Cleansing Oil if I do not wear makeup? i have my own formula too! LOL. found out if i got a super late night out, i just apply Olay total effects + sleeping mask and wakeup to good skin (albeit looking a bit off since not enough sleep), not sure if it repairs, but for emergency cases, i think it works! Brilliant idea! Kiehl’s doesn’t work for me though (gives me a nasty rash and makes me sneeze) but I’ll try mixing up my serums for a quick night fix one of these days. I bought the Kiehl’s Midnight Recovery Serum since they didn’t have any samples and the RM10 rebate for every RM100 spent was on and I love it! 😀 Worked extremely well to heal my acne scarring and provide hydration. 🙂 I use about 3-4 drops though, cos I use it alone without moisturisers (and I probably have a large face!). Nevertheless, for the results, I’d still buy it even if it runs out fast! Oh yeah buying it during their promotion period is the smartest thing to do! 😉 I gotta agree with you. If you use it just by itself then you might need more drops but if you use it, like me as a serum and then with a moisturizer over, 2 drops is enough 😀 And even using 3-4 drops, its not going to run out in a hurry! Mixing both of the products in one is awesome!! I never though of that because I was afraid that both diff products might not work together and cause acne on my face. As much as I love ANR serum, now I want the Kiehl’s. Err…. I’m not a mad scientist for nothing 😉 But you know, it works brilliantly for me but it might not for you so proceed with caution! Well no better time to start than the present. I’m not scared to grow older but I don’t have to look it! Haha! Now you have me wanting to buy that Kiehls. Habis. Ahhh… now I want ANR just for glowy skin… but yes, it’s a splurge! Yeee… i finished my ANR already… and just got Kiehl’s. You and Legeeque got me very intrigued. Was actually going to give the bottle of ANR to my mum, but after seeing this, I, err, took it out of the bag 😛 Will get a sample of the Kiehl’s and try out the recipe. ROFLOL! Looks like Mom has to get her own ANR huh? 😉 I hope my mad scientist recipe works for you! ANR is a wonderful product! Now you’ve got me intrigued with the Kiehl’s one. Yes I do. 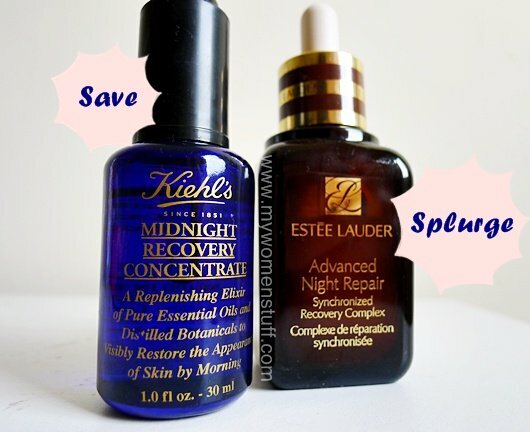 The Kiehl’s Midnight Recovery Concentrate is an oil but the Estee Lauder one isn’t. I don’t find either of these serums hydrating enough on their own although they do absorb well into my skin. I don’t think the oils block the skin or penetration of moisturisers. I use moisturizers mostly for hydration and I believe it works better together with the serums.